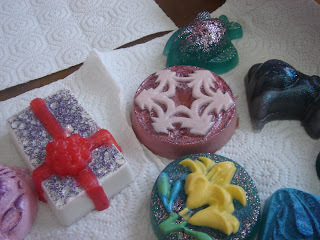 These soaps were made by first timers at Otion’s Soap Bar. Aren’t they amazing for first timers? Our soap bar is open to anyone that wants to come make soap. You rent the bar for $7.50 (and get unlimited use of fragrance, color and molds) and only need to buy the soap base that is used. 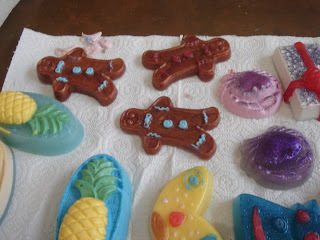 Of course, Erik did a great job instructing them and helping out in between customers but I think that they had some soapmaking blood in their veins because these are very artistic soaps. 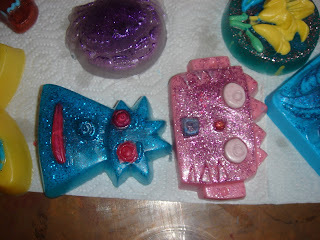 Copious use of glitter makes these Alien Head soaps really stand out. Today, Monday, I teach a Cold Process Soapmaking class at Otion. We have two spots left for the 5:15 class. If you’re in Bellingham, sign up by calling the store at 360-676-1030. I’m so glad that you’re enjoying the blog. I hope that we can continue to do cool helpful projects in the future. Thanks for being a regular reader. Hi! I’m Grace from the Philippines and I’ve recently started reading your blog. A couple of months ago, my husband and I started re-selling handcrafted soap for a friend. I got so into it that I’ve been learning as much as I can about making soap! Your blog is so informative and wonderful. It’s great to have such a valuable resource at my fingertips even though I’m oceans away! Keep it up, Anne! Thank you so much! 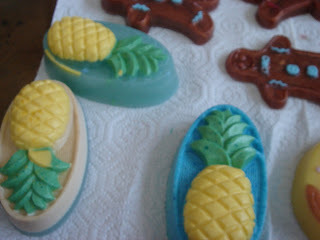 I see some very talented 1st time soap makers! I especially like the gingerbread man trimmed in blue.